A DAQ™ is Atec’s custom engine test software and system, built upon the industry-proven National Instruments LabVIEW and LabWindows™/CVI. 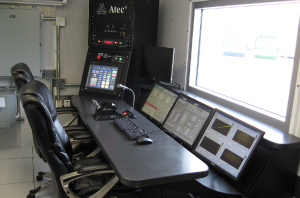 Atec’s Data Acquisition and Control System is a modern, full-featured, highly integrated hardware and software solution that is applicable to most commercial and military turbine engine test cell applications. It is robust, versatile, user friendly, and specifically designed to handle the demanding requirements of engine testing. ADAQ™ links seamlessly to digital engine modules (FADECs, DEECs, EECs, ECUs) as well as older analog and mechanical controls. ADAQ™ has been designed and improved since version 1.0 in 2006. Users can create, remove, calibrate & display channels, and generate custom calculations, screens and reports. Hardware flexibility with PLCs, Console layouts, UPSs, Input devices and custom user interfaces offer popular options, so important to today’s Commercial customers. 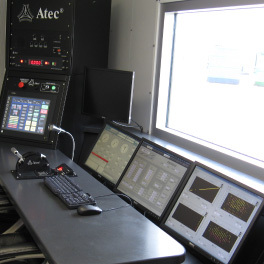 Beyond the most impressive manual throttle control and operation available, Atec’s new ADAQ™ 3.8 now offers the option of fully automated test. Atec has listened to the feedback of users and OEMs. ADAQ™ has been simplified and streamlined for operators. Startup has been shortened, and primary run screens have been uncrowded. More complex data gathering, trending, and calculations are running in the background, until the operator clicks on it for display, report generation or data transmission. ADAQ™ has been designed to be quickly and easily reconfigured for all engine types with the capability to accommodate installations in new test facilities or upgrades to older test cells. Because process reliability is a key component of any test system, ADAQ™ includes displays of all critical test data, engine and facility status, multi-level alarming, custom report generation and network connectivity. The entire data acquisition and control system is housed in the control console. The system is assembled, verified, and tested at Atec prior to shipment to the customer’s facility. This reduces the amount of test cell down time, minimizing the impact on the production schedule. ADAQ™ is fully capable of all testing for F100, F110, TF34 and J85 engines. ADAQ™ and predecessor systems are now running these USAF inventory engines in over a dozen countries. Collaborative efforts with Celtech now offer upgrades of ENDASII™ and EDACS™ in joining ADAQ™ to also run JT8, JT9D, CF6, CFM56, V2500, F404, F414, F124, F125, TFE 731, TPE 331, T38, T53, T55, T56, 501D, AE2100, T63, T64, PT6, T700, T701, A250, RR300, multiple APUs and test benches for 25 customers at over 50 locations worldwide. Vital Link Europe’s FADAS system is also based on LabView, and reviews are expected to further improve offered systems. ADAQ™ is now USAF approved for control of T20 jet, T4 jet, and T21D turboprop test cells. 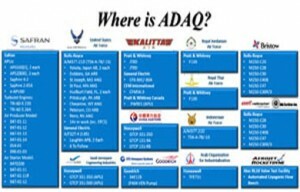 ADAQ™ has FAA certification/approval for a long list of commercial engines, and APUs & test benches. Typical Intermediate and Depot level configurations are available to match popular user requirements. Just announced, our very popular ADAQ™ is now available for users on travel or away from the test cell. ADAQ OTK™ (Offsite Test Kit) is our complete data acquisition base system packaged for durable portability. In addition to our data acquisition experience, Atec can also handle Programmable Logic Controller (PLC) system integration, as well as power and utilities interfacing. Targeted for large high-bypass Commercial and advanced afterburning engines, ADAQ™ 4.0 is in development for delivery in mid 2018. 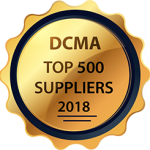 New applications and certifications for ADAQ and our family of DAS products continue to grow at a very brisk pace.